With the spread of computers to ordinary people, computer security is becoming increasingly important. User authentication is one of the most important technologies for computer security. Although passwords are used in many personal computers, they are known to sometimes have problems. As an alternative to passwords, biometric authentication, such as fingerprint authentication and face recognition-based authentication, is becoming more widely used. 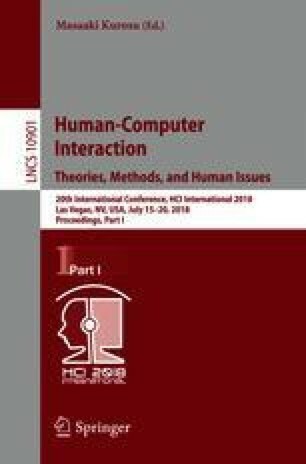 In this paper, we propose a hand gesture-based method as a new kind of biometric authentication. It supports three-dimensional (3D) gestures that allow its user to move the user’s hand without touching an input device. Using the motions of fingertips and finger joints as biometric data, the method improves the performance of authentication. Also, we propose seven 3D gestures that can be classified into three types. We implemented the method by using a 3D motion sensor called the Leap Motion controller. We present the results of an experiment that we conducted with nine participants to evaluate the method. For all the gestures, the true acceptance rates were more than 90%, and the equal error rates were less than 4%. This work was partly supported by JSPS KAKENHI Grant Number JP15KK0016.